Available in White, Green, Titanium and Burgundy. The Carmen Opera Glasses come complete with a stylish chain ensuring a comfortable hold throughout the performance and are complete with a Gold outline finish. Burgundy / Gold color combination and attached neck chain, traditional design. 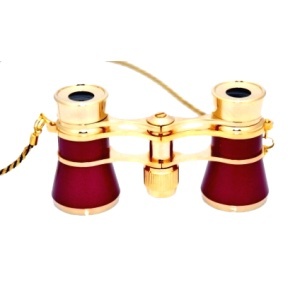 Lightweight and compact, Carmen opera glasses feature an attached neck chain for hands-free, comfortable wearing. Ÿ__CarmenŸ_� combines style and comfort to deliver the ultimate enjoyment of your favorite events.